As of fan, I’m getting a little frustrated of certain boxers who claim that they want to fight the best or they won’t fight someone who is a true threat. To shield their unwillingness to fight, they turn around and price themselves out of a fight, then they go to the media and tell the fans that their potential opponent doesn’t want to fight. The crazy thing is, you have fans that actually fall for it. For example, Anthony Joshua or should I say Eddie Hearn offered Deontay Wilder a flat fee of 12.5 million. According to Joshua’s promoter, this fight has the potential to make 100 million. So that means that if Wilder is to accept the offer then that is only 12.5%. No pay per view upside, revenue, nothing. Joseph Parker received a guarantee 33% (over $18.5 million) to fight Anthony Joshua. That’s not counting the revenue from pay per view sales. Now Parker, only had the WBO heavyweight championship belt just a little over a year with only 2 title defenses before he signed the contract to fight Joshua and he was able to get that deal. Now Wilder, has been a champion longer than Parker and Joshua with 7 title defense gets low balled. Why? Even when Wilder said he is willing to take the 40%, go to the UK and give Joshua the larger share. It appears to be a reasonable offer, with both combatants will be grossing their highest payday. So why the hard no? It’s obvious that Joshua and his team doesn’t want the fight right now. Anybody who is actually in the sport of boxing will tell you, if two fighters want to make the fight the fight gets made. They say boxing is a business. The way the business of boxing is today, many boxers nowadays takes the model “maximize reward, minimum risk” approach. Whenever there is a big fight that the fans truly want to see, it appears that the “A-side” fighter is the one that holds up a lot of the negotiations. By offering their opponent a ridiculous offer that they themselves would refuse. Floyd Mayweather did it to Manny Pacquiao and Canelo Alvarez did it Gennady Golovkin. Floyd and Canelo didn’t soften their stance in negotiations until their rivals showed signs of slippage, slowing down, and vulnerability. It was until then the fight got made. Now back to Wilder and Joshua. 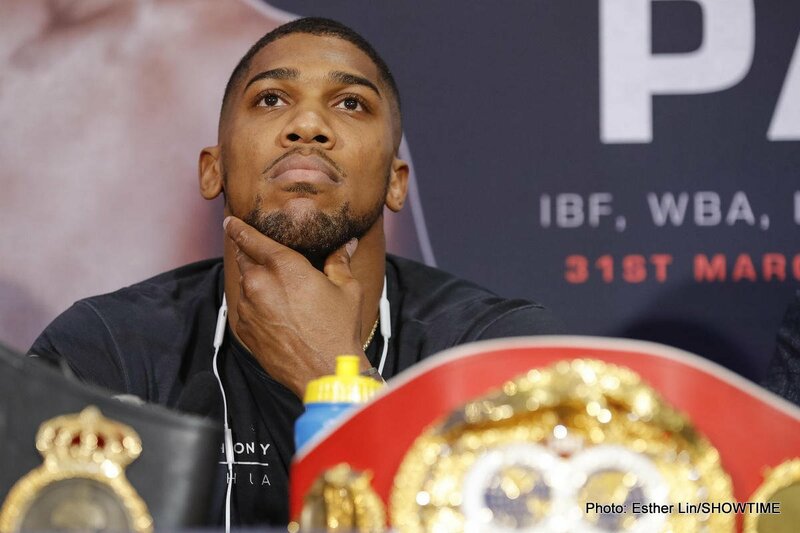 Joshua talked a good game after his fight with Parker a couple of weeks ago saying that he wants Deontay Wilder next and he would “Knock him the spark out!” But earlier this week Joshua’s promoter Eddie Hearn in a recent interview said that he is trying to target Jarrell Miller or Alexander Povetkin towards the end of the summer of 2018 as an opponent for Anthony Joshua. So what is all of this posturing tells me? That either Joshua or Eddie Hearn doesn’t wants this fight…yet. Deontay Wilder is a threat to anybody he steps in the ring with, that’s why they are trying to take a different path to the WBC heavyweight championship..
60/40 goes to the winner of about if it goes to decision. 50/50 if the fight ends in a draw/majority draw. Penalty of 50% of the fighters purse will go to his opponent if the fighter does not make weight only if the fight is allowed to happen. If a boxer comes up positive on a banned substance after a bout and is found guilty of intentionally taking said substance, they will have to relinquish 90% of their purse to their opponent with a year suspension. Second positive test on a banned substance after a bout and is found guilty of intentionally taking said substance, is life time ban from the sport of boxing and forfeiture of all monies earned in the bout which goes to his opponent. With this, we can take out all of the posturing and perpetrating that is hurting our sports, and clean it up at the same time to make it better so we can see the fights we want to see in a timely manner. You are here: Home / Boxing News / Posturing or Perpetrating?